Bio.PDB is a Biopython module that focuses on working with crystal structures of biological macromolecules. This document gives a fairly complete overview of Bio.PDB. Bio.PDB is automatically installed as part of Biopython. Biopython can be obtained from http://www.biopython.org. It runs on many platforms (Linux/Unix, windows, Mac,…). Bio.PDB was used in the construction of DISEMBL, a web server that predicts disordered regions in proteins , and COLUMBA, a website that provides annotated protein structures (not longer available?). Bio.PDB has also been used to perform a large scale search for active sites similarities between protein structures in the PDB (see Proteins 51: 96–108, 2003), and to develop a new algorithm that identifies linear secondary structure elements (see BMC Bioinformatics 6: 202, 2005). Judging from requests for features and information, Bio.PDB is also used by several LPCs (Large Pharmaceutical Companies :-). Is there a Bio.PDB reference? The article can be freely downloaded via the Bioinformatics journal website. I welcome e-mails telling me what you are using Bio.PDB for. Feature requests are welcome too. How well tested is Bio.PDB? Pretty well, actually. Bio.PDB has been extensively tested on nearly 5500 structures from the PDB - all structures seemed to be parsed correctly. More details can be found in the Bio.PDB Bioinformatics article. Bio.PDB has been used/is being used in many research projects as a reliable tool. In fact, I’m using Bio.PDB almost daily for research purposes and continue working on improving it and adding new features. The PDBParser performance was tested on about 800 structures (each belonging to a unique SCOP superfamily). This takes about 20 minutes, or on average 1.5 seconds per structure. Parsing the structure of the large ribosomal subunit (1FKK), which contains about 64000 atoms, takes 10 seconds on a 1000 MHz PC. In short: it’s more than fast enough for many applications. Why should I use Bio.PDB? Bio.PDB might be exactly what you want, and then again it might not. If you are interested in data mining the PDB header, you might want to look elsewhere because there is only limited support for this. If you look for a powerful, complete data structure to access the atomic data Bio.PDB is probably for you. Is there support for molecular graphics? I’d be crazy to write another molecular graphics application (been there done that, actually :-). How do I create a structure object from a PDB file? How do I create a structure object from an mmCIF file? …and what about the new PDB XML format? That’s not yet supported, but I’m definitely planning to support that in the future (it’s not a lot of work). Contact me if you need this, it might encourage me :-). Can I access the header information? Thanks to Christian Rother you can access some information from the PDB header. Note however that many PDB files contain headers with incomplete or erroneous information. Many of the errors have been fixed in the equivalent mmCIF files. Hence, if you are interested in the header information, it is a good idea to extract information from mmCIF files using the MMCIF2Dict tool described above, instead of parsing the PDB header. Now that is clarified, let’s return to parsing the PDB header. The structure object has an attribute called header which is a python dictionary that maps header records to their values. The available keys are name, head, deposition_date, release_date, structure_method, resolution, structure_reference (maps to a list of references), journal_reference, author and compound (maps to a dictionary with various information about the crystallized compound). Can I use Bio.PDB with NMR structures (ie. with more than one model)? Sure. Many PDB parsers assume that there is only one model, making them all but useless for NMR structures. The design of the Structure object makes it easy to handle PDB files with more than one model (see section The Structure Object). How do I download structures from the PDB? This can be done using the PDBList object, using the retrieve_pdb_file method. The argument for this method is the PDB identifier of the structure. The downloaded file will be called pdb1fat.ent and stored in the current working directory. Note that the retrieve_pdb_file method also has an optional argument pdir that specifies a specific directory in which to store the downloaded PDB files. The retrieve_pdb_file method also has some options for specifying the compression format used for the download, and the program used for local decompression (default .Z format and gunzip). In addition, the PDB ftp site can be specified upon creation of the PDBList object. By default, the ftp server of the Worldwide Protein Data Bank is used. See the API documentation for more details. Thanks again to Kristian Rother for donating this module. How do I download the entire PDB? The API method for this is called download_entire_pdb. Adding the -d option will store all files in the same directory. Otherwise, they are sorted into PDB-style subdirectories according to their PDB ID’s. Depending on the traffic, a complete download will take 2-4 days. How do I keep a local copy of the PDB up-to-date? One can of course make a weekly cronjob out of this to keep the local copy automatically up-to-date. The PDB ftp site can also be specified (see API documentation). PDBList has some additional methods that can be of use. The get_all_obsolete method can be used to get a list of all obsolete PDB entries. The changed_this_week method can be used to obtain the entries that were added, modified or obsoleted during the current week. For more info on the possibilities of PDBList, see the API documentation. What about all those buggy PDB files? It is well known that many PDB files contain semantic errors (I’m not talking about the structures themselves, but their representation in PDB files). Bio.PDB tries to handle this in two ways. The PDBParser object can behave in two ways: a restrictive way and a permissive way (THIS IS NOW THE DEFAULT). The restrictive way used to be the default, but people seemed to think that Bio.PDB ‘crashed’ due to a bug (hah! ), so I changed it. If you ever encounter a real bug, please tell me immediately! These errors indicate real problems in the PDB file (for details see the Bioinformatics article). In the restrictive state, PDB files with errors cause an exception to occur. This is useful to find errors in PDB files. Some errors however are automatically corrected. Normally each disordered atom should have a non-blank altloc identifier. However, there are many structures that do not follow this convention, and have a blank and a non-blank identifier for two disordered positions of the same atom. This is automatically interpreted in the right way. Sometimes a structure contains a list of residues belonging to chain A, followed by residues belonging to chain B, and again followed by residues belonging to chain A, i.e. the chains are ‘broken’. This is also correctly interpreted. Can I write PDB files? Use the PDBIO class for this. It’s easy to write out specific parts of a structure too, of course. If this is all too complicated for you, the Dice module contains a handy extract function that writes out all residues in a chain between a start and end residue. Can I write mmCIF files? I don’t need it at all, and it’s a lot of work, plus no-one has ever asked for it). People who want to add this can contact me. What’s the overall layout of a Structure object? This is the way many structural biologists/bioinformaticians think about structure, and provides a simple but efficient way to deal with structure. Additional stuff is essentially added when needed. 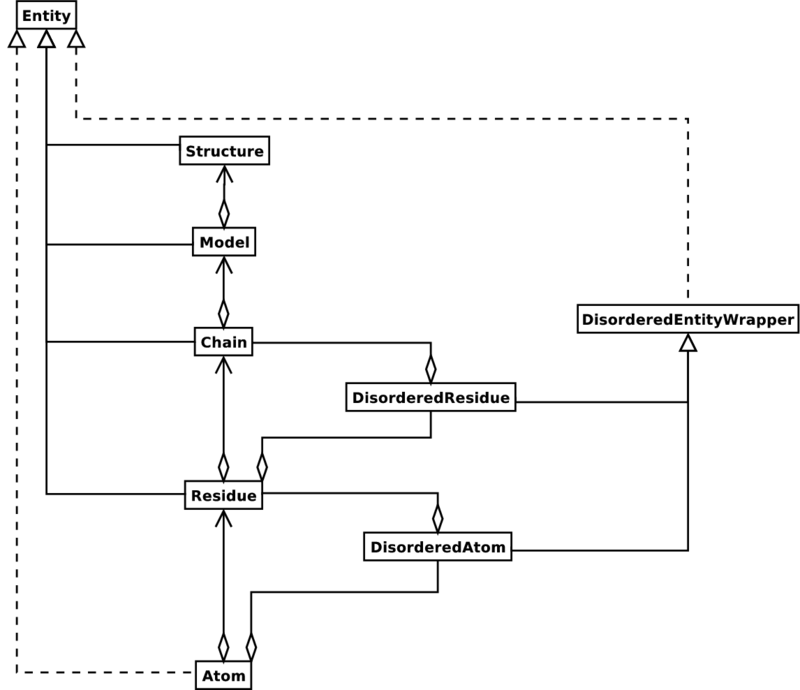 A UML diagram of the Structure object (forgetting about the Disordered classes for now) is shown in the figure below. Diagram of SMCRA architecture of the Structure object. Full lines with diamonds denote aggregation, full lines with arrows denote referencing, full lines with triangles denote inheritance and dashed lines with triangles denote interface realization. How do I navigate through a Structure object? You can also test whether an Entity has a certain child using the has_id method. Can I do that a bit more conveniently? For more info, see the API documentation. How do I extract a specific Atom/Residue/Chain/Model from a Structure? What is a model id? The model id is an integer which denotes the rank of the model in the PDB/mmCIF file. The model id starts at 0. Crystal structures generally have only one model (with id 0), while NMR files usually have several models. What is a chain id? The chain id is specified in the PDB/mmCIF file, and is a single character (typically a letter). What is a residue id? The hetero-flag: this is 'H_' plus the name of the hetero-residue (e.g. 'H_GLC' in the case of a glucose molecule), or 'W' in the case of a water molecule. The insertion code, e.g. 'A'. The insertion code is sometimes used to preserve a certain desirable residue numbering scheme. A Ser 80 insertion mutant (inserted e.g. between a Thr 80 and an Asn 81 residue) could e.g. have sequence identifiers and insertion codes as follows: Thr 80 A, Ser 80 B, Asn 81. In this way the residue numbering scheme stays in tune with that of the wild type structure. The reason for the hetero-flag is that many, many PDB files use the same sequence identifier for an amino acid and a hetero-residue or a water, which would create obvious problems if the hetero-flag was not used. What is an atom id? The atom id is simply the atom name (eg. 'CA'). In practice, the atom name is created by stripping all spaces from the atom name in the PDB file. However, in PDB files, a space can be part of an atom name. Often, calcium atoms are called 'CA..' in order to distinguish them from Cα atoms (which are called '.CA.'). In cases were stripping the spaces would create problems (ie. two atoms called 'CA' in the same residue) the spaces are kept. This is one of the strong points of Bio.PDB. It can handle both disordered atoms and point mutations (ie. a Gly and an Ala residue in the same position). Disorder should be dealt with from two points of view: the atom and the residue points of view. In general, I have tried to encapsulate all the complexity that arises from disorder. If you just want to loop over all Cα atoms, you do not care that some residues have a disordered side chain. On the other hand it should also be possible to represent disorder completely in the data structure. Therefore, disordered atoms or residues are stored in special objects that behave as if there is no disorder. This is done by only representing a subset of the disordered atoms or residues. Which subset is picked (e.g. which of the two disordered OG side chain atom positions of a Ser residue is used) can be specified by the user. Disordered atom positions are represented by ordinary Atom objects, but all Atom objects that represent the same physical atom are stored in a DisorderedAtom object (see section The Structure Object). Each Atom object in a DisorderedAtom object can be uniquely indexed using its altloc specifier. The DisorderedAtom object forwards all uncaught method calls to the selected Atom object, by default the one that represents the atom with the highest occupancy. The user can of course change the selected Atom object, making use of its altloc specifier. In this way atom disorder is represented correctly without much additional complexity. In other words, if you are not interested in atom disorder, you will not be bothered by it. A special case arises when disorder is due to point mutations, i.e. when two or more point mutants of a polypeptide are present in the crystal. An example of this can be found in PDB structure 1EN2. Since these residues belong to a different residue type (e.g. let’s say Ser 60 and Cys 60) they should not be stored in a single Residue object as in the common case. In this case, each residue is represented by one Residue object, and both Residue objects are stored in a single DisorderedResidue object (see section The Structure Object). The DisorderedResidue object forwards all uncaught methods to the selected Residue object (by default the last Residue object added), and thus behaves like an ordinary residue. Each Residue object in a DisorderedResidue object can be uniquely identified by its residue name. In the above example, residue Ser 60 would have id ‘SER’ in the DisorderedResidue object, while residue Cys 60 would have id ‘CYS’. The user can select the active Residue object in a DisorderedResidue object via this id. Example: suppose that a chain has a point mutation at position 10, consisting of a Ser and a Cys residue. Make sure that residue 10 of this chain behaves as the Cys residue. In addition, you can get a list of all Atom objects (ie. all DisorderedAtom objects are ‘unpacked’ to their individual Atom objects) using the get_unpacked_list method of a (Disordered)Residue object. Can I sort residues in a chain somehow? Yes, kinda, but I’m waiting for a request for this feature to finish it :-). How are ligands and solvent handled? See ‘What is a residue id?’. Well, yes! Bio.PDB supports isotropic and anisotropic B factors, and also deals with standard deviations of anisotropic B factor if present (see the section Analysis). What about standard deviation of atomic positions? Yup, supported. See the section Analysis. Sure, sure. Everybody is always coming up with (mostly vaporware or partly implemented) data structures that handle all possible situations and are extensible in all thinkable (and unthinkable) ways. The prosaic truth however is that 99.9% of people using (and I mean really using!) crystal structures think in terms of models, chains, residues and atoms. The philosophy of Bio.PDB is to provide a reasonably fast, clean, simple, but complete data structure to access structure data. The proof of the pudding is in the eating. Moreover, it is quite easy to build more specialised data structures on top of the Structure class (eg. there’s a Polypeptide class). On the other hand, the Structure object is built using a Parser/Consumer approach (called PDBParser/MMCIFParser and StructureBuilder, respectively). One can easily reuse the PDB/mmCIF parsers by implementing a specialised StructureBuilder class. It is of course also trivial to add support for new file formats by writing new parsers. How do I extract information from an Atom object? How do I extract information from a Residue object? How do I measure distances? That’s simple: the minus operator for atoms has been overloaded to return the distance between two atoms. How do I measure angles? How do I measure torsion angles? How do I determine atom-atom contacts? Use NeighborSearch. This uses a KD tree data structure coded in C behind the screens, so it’s pretty darn fast (see Bio.KDTree). How do I extract polypeptides from a Structure object? Use PolypeptideBuilder. You can use the resulting Polypeptide object to get the sequence as a Seq object or to get a list of Cα atoms as well. Polypeptides can be built using a C-N or a Cα-Cα distance criterion. Note that in the above case only model 0 of the structure is considered by PolypeptideBuilder. However, it is possible to use PolypeptideBuilder to build Polypeptide objects from Model and Chain objects as well. How do I get the sequence of a structure? The first thing to do is to extract all polypeptides from the structure (see previous entry). The sequence of each polypeptide can then easily be obtained from the Polypeptide objects. The sequence is represented as a Biopython Seq object, and its alphabet is defined by a ProteinAlphabet object. How do I determine secondary structure? For this functionality, you need to install DSSP (and obtain a license for it - free for academic use). Then use the DSSP class, which maps Residue objects to their secondary structure (and accessible surface area). The DSSP codes are listed in the Table below. Note that DSSP (the program, and thus by consequence the class) cannot handle multiple models! How do I calculate the accessible surface area of a residue? Use the DSSP class (see also previous entry). But see also next entry. How do I calculate residue depth? Residue depth is the average distance of a residue’s atoms from the solvent accessible surface. It’s a fairly new and very powerful parameterization of solvent accessibility. For this functionality, you need to install Michel Sanner’s MSMS program. Then use the ResidueDepth class. This class behaves as a dictionary which maps Residue objects to corresponding (residue depth, Cα depth) tuples. The Cα depth is the distance of a residue’s Cα atom to the solvent accessible surface. You can also get access to the molecular surface itself (via the get_surface function), in the form of a NumPy array with the surface points. How do I calculate Half Sphere Exposure? Half Sphere Exposure (HSE) is a new, 2D measure of solvent exposure. Basically, it counts the number of Cα atoms around a residue in the direction of its side chain, and in the opposite direction (within a radius of 13 Å). Despite its simplicity, it outperforms many other measures of solvent exposure. An article describing this novel 2D measure has been submitted. HSE comes in two flavors: HSEα and HSEβ. The former only uses the Cα atom positions, while the latter uses the Cα and Cβ atom positions. The HSE measure is calculated by the HSExposure class, which can also calculate the contact number. The latter class has methods which return dictionaries that map a Residue object to its corresponding HSEα, HSEβ and contact number values. How do I map the residues of two related structures onto each other? First, create an alignment file in FASTA format, then use the StructureAlignment class. This class can also be used for alignments with more than two structures. How do I test if a Residue object is an amino acid? Can I do vector operations on atomic coordinates? Atom objects return a Vector object representation of the coordinates with the get_vector method. Vector implements the full set of 3D vector operations, matrix multiplication (left and right) and some advanced rotation-related operations as well. See also next question. How do I put a virtual Cβ on a Gly residue? This example shows that it’s possible to do some quite nontrivial vector operations on atomic data, which can be quite useful. In addition to all the usual vector operations (cross (use **), and dot (use *) product, angle, norm, etc.) and the above mentioned rotaxis function, the Vector module also has methods to rotate (rotmat) or reflect (refmat) one vector on top of another. How do I superimpose two structures? Surprisingly, this is done using the Superimposer object. This object calculates the rotation and translation matrix that rotates two lists of atoms on top of each other in such a way that their RMSD is minimized. Of course, the two lists need to contain the same amount of atoms. The Superimposer object can also apply the rotation/translation to a list of atoms. The rotation and translation are stored as a tuple in the rotran attribute of the Superimposer object (note that the rotation is right multiplying!). The RMSD is stored in the rmsd attribute. The algorithm used by Superimposer comes from Matrix computations, 2nd ed. Golub, G. & Van Loan (1989) and makes use of singular value decomposition (this is implemented in the general Bio.SVDSuperimposer module). How do I superimpose two structures based on their active sites? Pretty easily. Use the active site atoms to calculate the rotation/translation matrices (see above), and apply these to the whole molecule. Can I manipulate the atomic coordinates? Yes, using the transform method of the Atom object, or directly using the set_coord method. See the main Biopython tutorial. You haven’t answered my question yet! Woah! It’s late and I’m tired, and a glass of excellent Pedro Ximenez sherry is waiting for me. Just drop me a mail, and I’ll answer you in the morning (with a bit of luck…). Kristian Rother donated code to interact with the PDB database, and to parse the PDB header. Indraneel Majumdar sent in some bug reports and assisted in coding the Polypeptide module. Many thanks to Brad Chapman, Jeffrey Chang, Andrew Dalke and Iddo Friedberg for suggestions, comments, help and/or biting criticism :-). Yes, yes, yes! Just send an e-mail to Thomas Hamelryck or to the Biopython developers if you have something useful to contribute! Eternal fame awaits!